(1 Queen + 1 Single Bed). Our Standard Rooms look out onto courtyard. Kitchenette includes microwave, toast etc. hotplate by request. 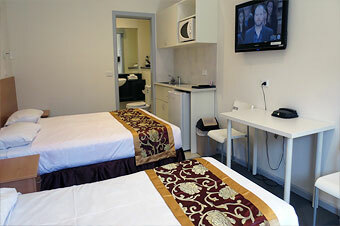 The affordable and comfortable Standard Rooms are value-for-money accommodation in Melbourne. Flagstaff City Inn Melbourne offers three types of Executive Studio: Executive Double Studio, Executive Twin Studio and Executive Triple Studio accommodation in Melbourne CBD location. Comfortable and affordable accommodation, suitable for business travellers and leisure travelers looking for accommodation in Melbourne. Flagastaff City Inn Melbourne has conference / function rooms for hire. Wireless Internet Facilities available (small fee apply), data phone connections provided in all rooms for those with internal modems in laptops. One Family Room is suitable for family with children, with room capacity of up to a maximum of 5 people. 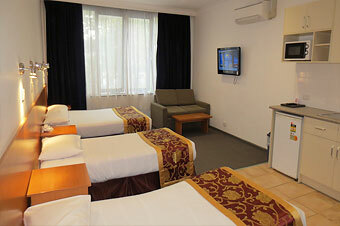 Spend quality family time together in Flagstaff City Inn Melbourne's One Family Room. 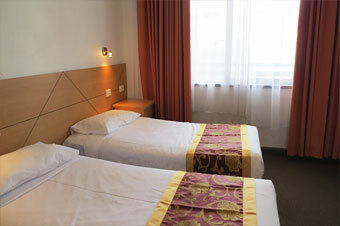 Our family room has a Double bed, 2 single beds and 1 bathroom. Basic kitchenette, hotplate available by request. The room is face to Dudley Street. Family Suite has ziped King Size Bed (can be split into 2 single beds on request when booking) in the Bedroom with en-suite. There is a Double size bed in living room and a Double size sofa bed. Self catering family accommodation comprising of full kitchen facilities stove, oven and Microwave and dining table etc. The Family Suite is suitable accommodation for family and friends, however party is not allowed. All the Family Suites are at third floor with balcony and there is not an elevator for the rooms. Rates for 4. Maximum capacity of up to 6 people. One Bedroom Apartment bedroom has 2 Single beds in bedroom with En-suite, a Queen bed in living room with basic kitchenette facilities. The room rate for 4 people. 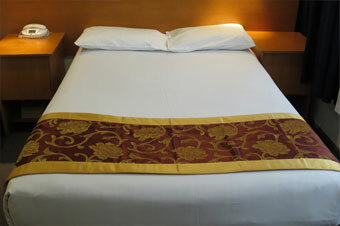 A rollaway bed available costs by request (surcharge). 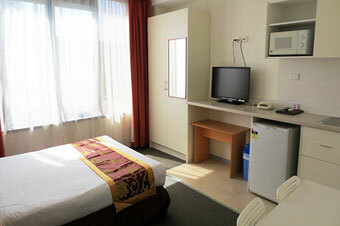 This room is suited for parents with kids or friends accommodation. 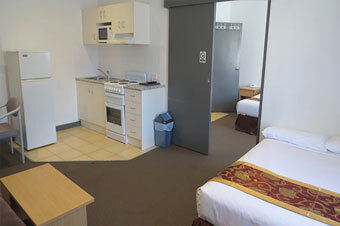 Flagstaff City Inn Melbourne's 2 Bedroom Apartments is fitted with a Queen Size bed in room, 2 Single beds in other room, one bathroom. There is a small living room with basic kitchenette facilities, Microwave, toast, Kettle and bar fridge. Hot plate is available by request. Living room has sofas . Great accommodation for friends and family travelling together. Rates are for 4 people, maximum of 4 people in the apartment.